Meat Smith Little India is also featured in my article in Destinasian here. 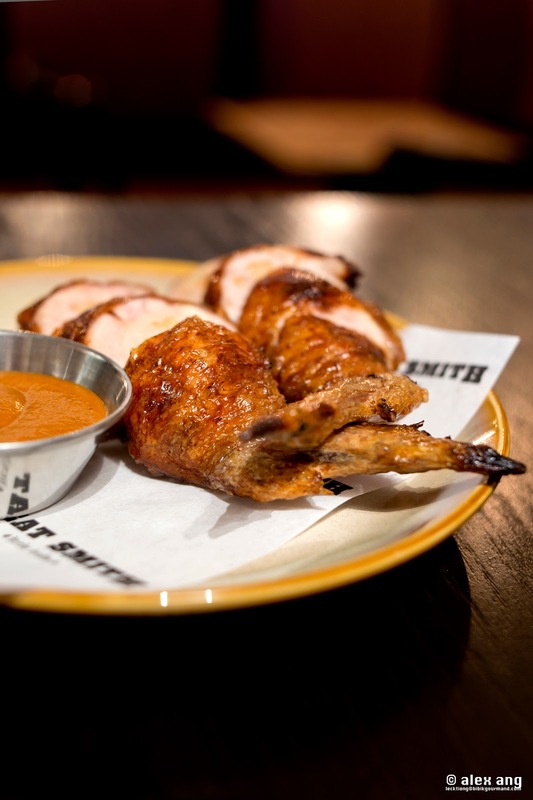 If you love meats and have a soft spot for Indian flavours, you may just fall head-over-heels for Meat Smith’s offshoot at Little India, a stablemate of Burnt Ends by David Pynt. 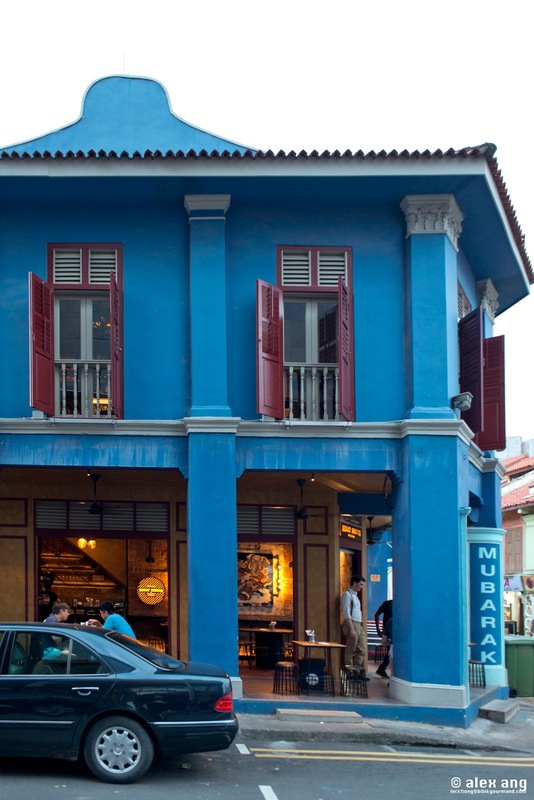 Occupying the ground floor space of a double-storey corner shophouse on Campbell Lane painted a glorious coat of blue, the non air-conditioned eatery sports exposed brick walls, peeling paint and exposed pipes for a grungy appeal. This is complemented by an army of bar stools and a bevy of antique ceiling lamps that are unmistakably Unlisted Collection’s. Stacked atop Meat Smith Little India is Rogue Trader, an equally grungy bar that stocks an unlikely collection of colonial Indian-inspired alcoholic beverages consisting of Indian wines, Indian whisky and colonial eta-inspired cocktails. 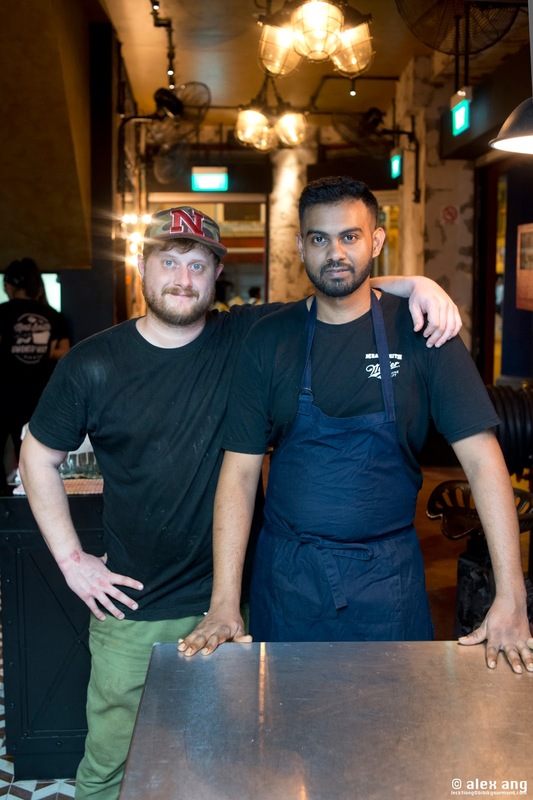 The open kitchen is jointly helmed by Meat Smith flagship’s head chef, Andrew Baldus, who hails from mid-Western USA and Penang-born Indian head chef, Manogren Murugan Thevar, who trained in European gastronomy in Holland. In creating the petite menu, Baldus combines his expertise in smoking and American BBQ with indian inspirations from Thevar’s heritage cuisine. The end product – American style BBQ with an Indian twist – is pretty riveting. At many sharing plate eateries, the snacks are sometimes the most interesting and this joint is no exception. And if we have to pick a snack to highlight, it has got to be the butter chicken hot pockets ($10 for 2 wings). Flesh from chicken wings are expertly carved out, all this time retaining its thin film of skin, mixed with cashew nuts and paneer cheese, then stuffed back into the skin and deep-fried before it finishes in the tandoori oven. Served with a butter chicken dipping sauce, the bone-less wings boast succulent flesh and an almost subtle milky taste with discernible chunks of nuts to make the bite all the more pleasurable. 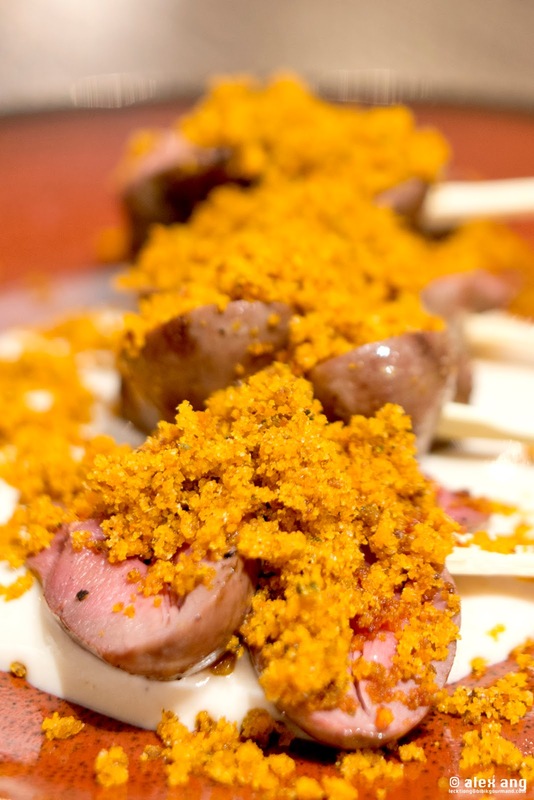 Offal aficionados should not miss the dry dhal duck hearts ($7 for 2 skewers of 2 hearts each). Skewered and cooked in the tandoor, the hearts arrive perfectly succulent and resting in a tangy sauce of tamarind yoghurt crema topped with a comforting blanket of home-made dry dhal crumbs. Also make room for the Madras pork cheeks ($8) – chunks of crisp-on-the-outside, melt-in-the-mouth fatty pork jowl with a spiced lentil rub – to be dunked in madras mustard sauce. Even without the sauce, the pork jowl alone is ace. For mains, more meat options abound. 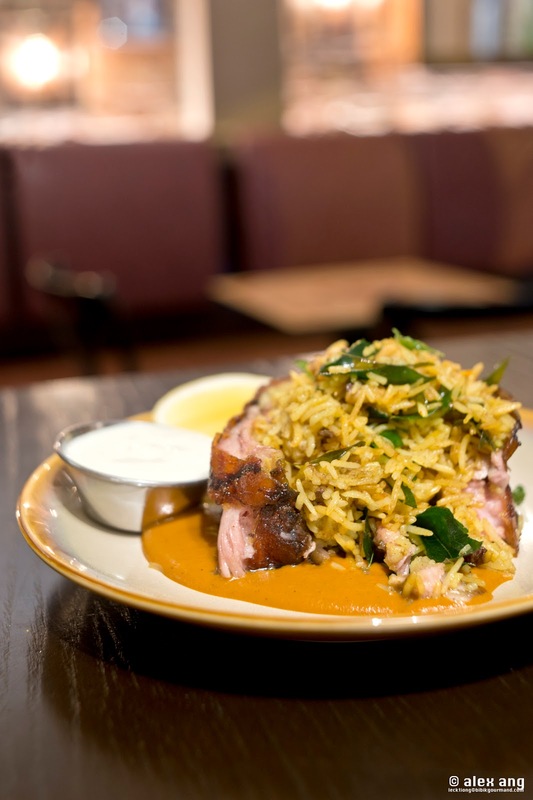 The biryani and suckling pig is a must – biryani rice locked in the warm embrace of suckling pig’s skin (and meat) arrives in a generous bath of madras curry mustard with a side of smoked raita. The rustic biryani rice is cooked as traditionally as can be so that it does not lose out to the ones you’ll find in the neighbourhood. 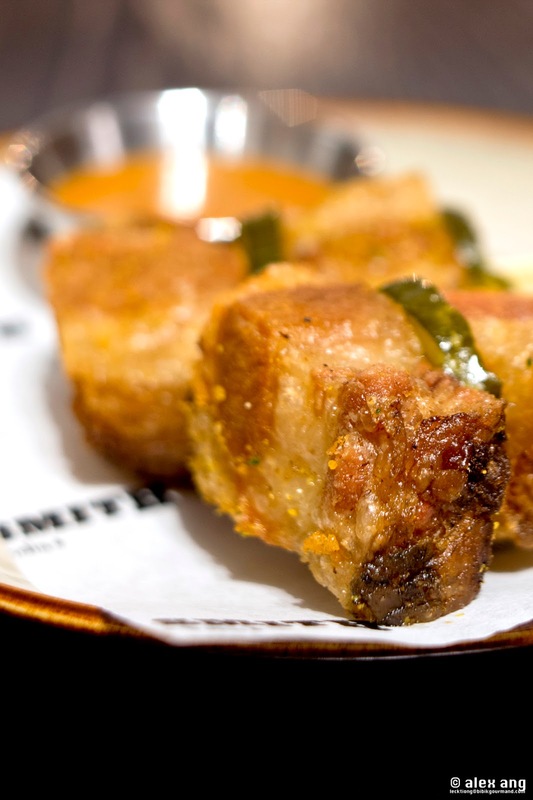 The rice is then stuffed into suckling pig that’s been spit-roasted and deep-fried immediately before serving. The suckling pig’s skin is not as crisp as what you’ll get in a Chinese eatery but it passes muster; the biryani, however, is admirable. Diners get a deeper peek at Thevar’s Penang heritage in the Thai-influenced dish of pork ribs with coconut chutney ($26). The smoked ribs are given a coconut and lemongrass glaze, then served with desiccated coconut and fried curry leaves for an invigoratingly delicious flavour of South East Asia. 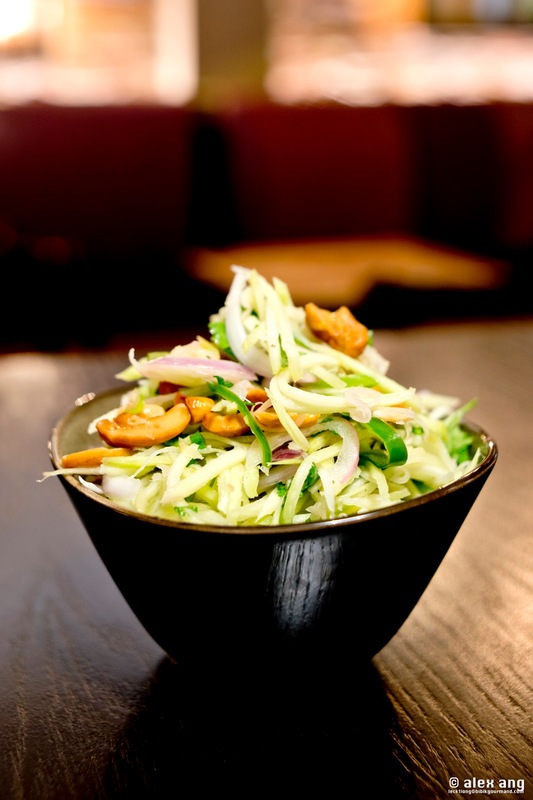 To cleanse your palate, order the green mango slaw ($5), an exhilarating toss-up of green mango strips with cashew nuts, onions, dill, coriander and green chillies. If there’s one dish that does not live-up to the expectation, it’s the lamb chops. They arrive at the table with a beautiful coat of chimichutney (chimichurri with house fermented green chillies) but are let down by a stubborn muttony flavour. Meat Smith’s Little India offshoot offers a unique dining experience that make the schlep to this part of town all the more exciting. Just don’t come here expecting a reboot of Meat Smith and you’ll not leave this place disappointed.